The past few weeks, I have been working with an athlete who hired me for Race Day Nutrition package. This is a 4 session package to revise most aspects of preparing for your race or event from a nutrition standpoint. We review your nutrition intake on a day-to-day basis to help balance blood sugar, and get you into fat burning vs sugar burning mode. We review and optimize your pre-race/event day meals. 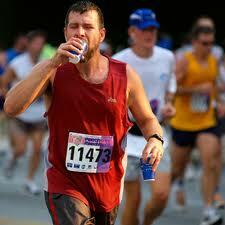 We review your Race day/ event fueling and hydration and recovery. I have noted those last 4 sessions I had with the client in the past 3 blog posts. We learned a lot and each week, we alleviated an issue, yet another either appeared or had not yet gone away. We made progress with each session. The last session was about re-hydration. We talk a lot about dehydration, and getting to the start of your event or training session dehydrated. We talk about how to recognize your signs of dehydration (another blog post), and how to avoid getting dehydrated (preventive sports nutrition) and what to do when you have signs of dehydration. These are all personally different. Each person has different needs and the solution is fairly simple, yet it is individual. But to rehydrate doesn’t seem to be mentioned often – it should be part of your recovery strategy. Especially if you are an endurance athlete, and have to do another long training ride or run the next day. With my client, the challenge was training the long hours and the interval workouts during the week which got him depleted by the end of the week. So by Saturday, when he was going out on his long 120 mile ride with a 6 mile run, he would feel blah sometimes before he even got halfway done with the bike. We worked on the fueling and hydration needs, optimized that and by the 3rd week, he felt strong during the whole session. Yes, a strong run off the bike, too! That third week, we focused on re-hydrating and getting more electrolytes in during the week, to help him replenish the electrolyte stores in preparing for the weekend sessions. So far so good! Coach and client are happy! That 4th week, the Saturday brick went really well, but then Sunday’s run was a bomb. He cut it short to only 6 miles, instead of the 16 he had planned. He was in tune with his body, and knew that pushing it would just be miserable and it would really end up being junk miles instead of any quality training. Training in a depleted state only makes for a longer week of recovery or maybe a potential injury. Injuries usually happen when dehydrated! So we worked on re-hydrating after the long sessions, so the next days training would be spot on, not an abandoned effort. This is the definition of re-hydrating. It is not just nutrients of carbohydrates and protein we think of in recovery meals, but electrolytes needing to be replenished. You need to build back those electrolyte stores for your next session! Re-hydrating. It should be a part of your recovery strategy. With this client, we focused on adding additional electrolytes daily (2 x Endurolytes per day in addition to what they were doing during training). Then we added 2 with each meal on Friday, the day before his long training session. You can pre-load electrolytes, but I suggest it only the day before. We continued with his electrolyte drink that had plenty of magnesium in it. We added one with dinner, and one serving with breakfast the morning of his long workouts. Then after the brick, we concentrated on re-hydrating. His recovery drink had the electrolytes, so we just added more of his electrolyte drink with dinner. Plus the additional Endurolytes as if we were pre-loading for a big workout the next day. His water intake also needed to maintained to rehydrate properly. Too much plain water may flush electrolytes out of the body. And we did not want that! We used the color of urine as a benchmark along with frequency of urination as a marker for this. If you are not thinking about re-hydrating, you need to put make it part of your recovery strategy. If you need help with this part, or any part of your race nutrition plan, schedule your session with me today. Joanna k Chodorowska, BA, NC, TPTH is a sports nutrition coach, helping clients use real food to optimize their performance. She is a triathlete with 2 sub 12 IM finishes. She has dehydrated, one time needing 5 IV’s so she understands not only the importance of hydration, but also what the symptoms are in real terms. And how to realistically carry your hydration with you on longer events! She offers private sessions for both Race Day Nutrition Strategy Session (1 week before your race) and the Race Day Nutrition Package (4 weeks -2 months before your race). 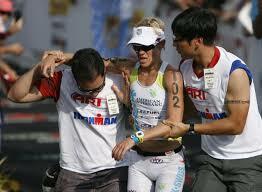 Joanna works with triathletes as well as cyclists, runners and endurance sports. She also works with beginner athletes just starting into their journey of sports!